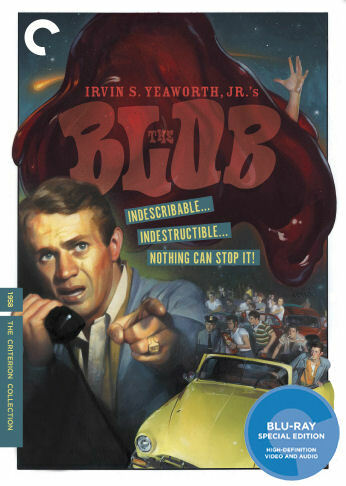 The Blob Site » Blog Archive » THE BLOB Goes Blu-Ray! The Blob has turned blue! Well, more exactly, The Blob is now available on blu-ray disc! The folks from the Criterion Collection, who have previously brought us a great DVD transfer of the film, have stepped up and released a new high definition transfer of the movie that hits store shelves today. This new digital transfer was created on in 4K resolution on a Scanity film scanner from the original 35mm camera negative; reel five, however, had to be scanned from a 35mm interpositive, due to the poor condition of that portion of the negative. Thousands of instances of dirt, debris, scratches, splices, warps, jitter, and flicker were manually removed using MTI’s DRS and Pixel Farm’s PFClean, while Image Systems’ Phoenix was used for small dirt, grain, and noise reduction. Now I know that’s some fairly technical talk and while I haven’t had a chance to see the disc myself yet, if this means it is an improvement over the already pretty spectacular DVD release from Criterion, then I can’t wait. You can order the Criterion blu-ray of The Blob by just clicking on the link. This entry was posted on Tuesday, March 12th, 2013 at 11:24 pm	and is filed under News. You can follow any responses to this entry through the RSS 2.0 feed. You can leave a response, or trackback from your own site. Maxblog | Design: Experten-Tricks of Kosmetik Versand. Coding: Autoreifen of Kurzreisen Ostsee.